April 11 is the due date for Project 3. For today’s session, you’ll write your reflection memo and (if you’re ready) submit your project. We will not talk about Project 3 in class after Friday 4/11; however, you have a one-week grace period if you need it. The very last moment when you can submit Project 3 is Friday, April 18 at 11:55 PM. For this project, your reflection memo will provide me with all the details about your project. You can look back at the Tests & Quizzes you have written during the last few weeks and use the relevant information you wrote in your answers. You will also tell me about what you have written. Scroll down to the text box below the headings Submission and Assignment Text. You will write your reflection memo in this box. Add your memo headers (To, From, Subject, and Date). Deliverables: List what they are for your project and tell me where to find them. 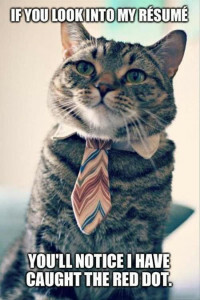 For example you might give me your LinkedIn link or the share link to your resume on Google Docs. You shared your list in your “04/02 P3 Criteria” In-Class Writing. Personal Goals: Tell me why you have chosen to complete the tasks that you did for your project. You shared your plans in your “03/28 P3 Topic” In-Class Writing. Self-Assessment: Tell me how well you met the criteria you set for yourself and the Expectations for Project 3. Think about what you did well, what you think is good enough, and what you could do better. Agree to the Honor Code by clicking the checkbox at the bottom of the page in Scholar. Submit your Project, and save a copy of the confirmation and submission ID. We will begin talking about Project 4: Web Analysis Report. In this project, you will work with your group to analyze some online resources and write a recommendation report. Your group will present your findings to the class in an oral presentation during the last week of classes. The readings for this project will be Chapter 13 (“Writing Recommendation Reports”) and the section on “Designing Web Sites” in Chapter 7 (pp. 169–174 of “Designing Documents and Web Sites”). Go ahead and begin reading these materials. We’ll look at some student examples of how to add details and data to your project in a Tips for Job-App Materials slide presentation that we will go over. I’ll also share a Facebook suggestion for those of you worried about an employer asking you to friend them so they can check out what you post. If you are looking for examples you can use as models, you might look for the profiles of colleagues you worked with at internships, other students, grad assistants, and your teachers. One warning: Do not use my LinkedIn, GitHub, or Academia.edu pages as your examples. None of them are up-to-date, and I would never hold up any of them as models for you. Go to “Tests & Quizzes” in Scholar and complete Wednesday’s assignment, “04/09 Proof of Work” by 5 PM on Tuesday, 04/10/2014. The in-class writing asks you to summarize what you worked on in class today. On Friday, 04/11, the project is due, so you’ll make any last-minute changes to your project and write your reflection memo. Note that I may be a few minutes late for the 1:25 Class. On Monday, 04/14, I will go over Project 4 and you’ll begin work on that project. For Project 4, you will work with your group to analyze some online resources and write a recommendation report. Your group will present your findings to the class in an oral presentation. The readings for this project will be Chapter 13 (“Writing Recommendation Reports”) and the section on “Designing Web Sites” in Chapter 7 (pp. 169–174 of “Designing Documents and Web Sites”). Please complete the short survey about the third project while I’m getting set up and calling the roll. I want to gather some feedback on this project. If you’re working in Google Docs, you can add your questions as comments. If you’re working elsewhere, you might type them into Notepad, TextEdit, or something similar. Get into your groups and take turns showing what you have worked on and the questions that you have. Everyone in the group should review the work of all group members and offer constructive feedback. If you’re working with Google Docs, you can use the commenting feature. Otherwise, you can talk it out together. As you review one another’s job-application materials, be mindful of the most common resume mistakes, as outlined by VT Career Services. Once everyone in your group has received feedback, go to “Tests & Quizzes” in Scholar and complete Monday’s assignment, “04/07 Peer Review” by 5 PM on Tuesday, 04/08/2014. The in-class writing asks you to summarize the feedback you heard, give a shout-out to anyone who offered especially good suggestions, and share your plans for applying the feedback and completing the project. For me to see your work on LinkedIn, I either need you to connect with me on LinkedIn or for you to make sure your privacy setting will let the public see your profile. 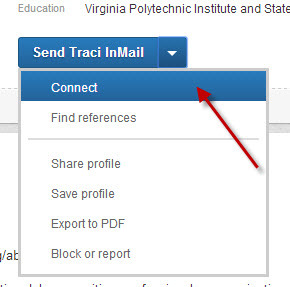 If you choose to connect with me, you can visit my LinkedIn profile page and use the Connect link under the email pulldown (shown below). If you want to change your privacy settings, follow LinkedIn’s instructions for changing your profile. On Wednesday, 04/09, I will share some ideas based on what I see in your peer review and answer any questions. On Friday, 04/11, the project is due, so you’ll work on finishing your project and on your reflection memo that day. Today’s class is devoted to independent work. You may work on your project wherever you like, but be sure that you track your work and provide me evidence of the effort you put in. We will not meet in the classroom, but you will put in at least 50 minutes of work on your project by 5 PM on Saturday. Effort counts on Project 3, so you want to demonstrate that you used your time wisely. If you’re composing a traditional cover letter and/or resume, you can give me a Share link to your Google Doc. I can use the File -> See revision history command to see what you worked on. If you’re working on a site like LinkedIn, you might take a screenshot of your page before you begin working and give me the link to your LinkedIn so I can see the current version (after your work). I will also ask you to summarize what you did so that I can see all the hard work you have put in. I will be in (or near) my office from 9:05 to noon and from 1:25 to 3:15. If you want to ask me questions, you can come by Shanks 214, send me an email during those hours, or use the online office chatroom. I will respond as soon as possible to any questions on Friday. We’ll do in-class peer review on Monday, so be ready with your current draft to share with your group. Looking ahead, on Wednesday, I will share some ideas based on what I see in your peer review and answer any questions. The project is due on Friday, so we’ll work on the reflection memo in class that day. If you are a Professional Writing Major or Minor, be sure to look at the Awards for Professional Writing Majors & Minors (and submit your work if it’s relevant). The deadline is April 18. I have revised the grade scale so that it works in the Scholar gradebook. Talk about how we want to work for Friday’s session. Create a working list of deliverables for Project 3. Work in Google Docs as you compose your list so that you can revise and collaborate easily. Everyone will turn in a reflection memo with the other deliverables, so be sure to include it on your list. Are the list items specific and accurate? Does the list include enough information to demonstrate effort? Use the remaining time to work on your projects. There is a lot of work to accomplish, so spend your time wisely. If you have a question that you need my help with, you can write your name on the board or just come up to my desk. I’ll be giving you feedback on your recent in-class writings while you work. Today, you need to post the tentative list of deliverables for Project 3, after reviewing them with your group members to make sure nothing is left out. Once you have your list complete, go to “Tests & Quizzes” in Scholar and complete today’s assignment, “04/02 P3 Criteria.” Just copy your list from Google Docs and paste it over to the In-Class Writing. Be sure to submit your work by Thursday, 04/03/2014 05:04:15 PM. Do what you need to do for your project. Unless something comes up, you will have the full class session on Friday to work on your project. I’m shifting the peer review session to next week (rather than this Friday) to give you more time to get your projects underway. Plan to have a working draft to share on Monday, April 7. It doesn’t have to be finished, but it should be enough that your group members can review it and give you some feedback. The Armstrong Family Foundation Award for Communication Design recognizes outstanding design in professional writing. The award is presented for work that demonstrates the ability to design information for a specific purpose and audience. It carries a cash prize of $200. The Robert Dedman, Jr. Award for Professional Writing recognizes outstanding work in professional writing that demonstrates the author’s ability to create effective texts that explain, instruct, or persuade for a specific audience and purpose. It carries a cash prize of $245. Robert Dedman, Jr. Award for Professional Writing with your submission.